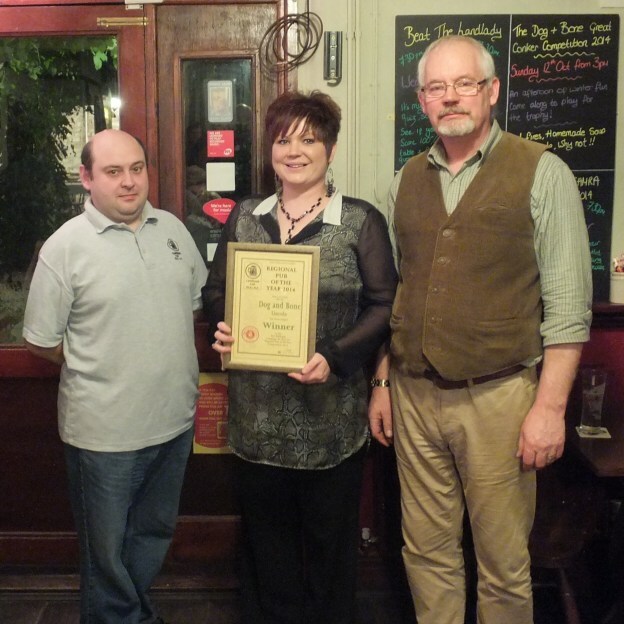 Lincolnshire CAMRA’s Pub of the Year, our very own Dog and Bone, John Street, Lincoln, has done it again! Blowing the competition out of the water, taking the crown of East Midlands Pub of the Year for 2014! • Leicestershire (inc. Rutland & Northamptonshire): Free Trade Inn, Sileby. Landlords Chris and Sarah Sorrell are over the moon after progressing to the last 16 in the competition. Central Southern Region: 5 Bells, Wickham, Berkshire. East Anglia Region: The Victoria Inn, Colchester. Kent Region: The Windmill, Sevenoaks Weald, Sevenoaks. Merseyside & Cheshire Region: The Freshfield, Freshfield, Formby. Scotland / Northern Ireland: The Steam Packet Inn, Isle of Whithorn, Scotland. West Pennines; Prince of Wales Foxfield, Cumbria. North East Region: The John Bull, Alnwick, Northumberland. Greater London Region: The Door Hinge, Welling. Greater Manchester Region: The Harewood Arms, Broadbottom. Yorkshire Region: The Kelham Island Tavern Sheffield, South Yorkshire. Surrey & Sussex Region: Surrey Oak, Parkgate, Newdigate. Wales Region: The Pilot, Mumbles, Swansea. West Midlands Region: The Beacon Hotel, Sedgley, Dudley. Wessex Region: The Lamplighter, St Helier.